Data collection, aka. getting the raw data... this is how it works! The first step for every data project is data collection, aka getting the actual raw data. You have your own data, instead of depending on 3rd party services. You have one unified data warehouse. No need for integrations, API hacks, and so on. You can trust your data 100%. You spend a significantly lower monthly fee on data server costs than on 3rd party tools. Either way you choose, it’s worth understanding how data collection works in general. Do it for yourself or using a 3rd party tool… very similar things are happening in the background! Let’s go with the simplest example! You are running a business data science project: you have a website and you would like to measure every click on this site (to create a website heatmap, a click map or anything). 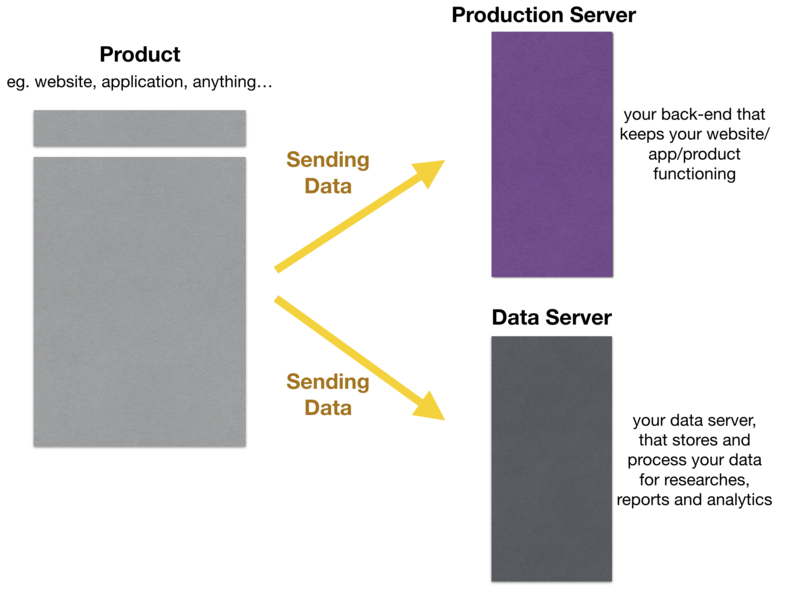 The tracking script sends a small data package to your data warehouse. You could track every action (let’s call it “event” ) on your website (or in your mobile app): page views, feature usage, etc… You can track and collect data even about mouse movements, if it’s needed. (Though usually it isn’t). When the data package hits your data warehouse, it can be stored in different formats. For startups the best format is the plain text format as it is very flexible. You can imagine this as a simple txt, csv or tsv file with text in it. Many companies follow this model. But it’s also worth to mention that many bigger – and older -companies (e.g. multinational companies) like to collect their data to SQL databases (or to other structured formats). There are several other ways, though. Let’s look at the simplest and most common solution: plain text format. These are the very basic data, that every data log should contain. As you can see, you can collect and store an infinite amount of data. Infinite vertically (the number of different events you can log) as well as horizontally (the number of dimensions you can collect about one event in one line). This raises the obvious question: what you should collect and what you shouldn’t. The principle here is very simple: collect everything you can. Every click, every pageview, every feature usage, everything. It’s interesting to note that most startups who follow this collect-everything-principle are actually using less than 10% of their data. 90% is not even touched by analysts! Then you would ask: so why do they collect everything? And the answer is: because you can never know when you might need that data in the future. Let’s say you want to change a 3-year-old feature of your product, and you don’t want to mess up anything. Before the change, you will spend some time to understand the exact role of that 3-year-old feature. And for that you will need to analyze your data retrospectively. But you can do that only if you started to collect the data 3 years ago. That’s the ultimate reason for collecting all possible data. What kind of data should you not collect? There are very obvious limitations, of course. The price of storing data is not one of those. Storing data (in the cloud at least) is very cheap today. engineering time: The web developers need to spend time to implement the tracking scripts. And if you have a really complex data warehouse, then you will need a full-time person to build and maintain the data infrastructure. So if your developers spend more time on collecting data than on actual production, then maybe you are collecting too much data. common sense: yes, you can overload your database — if you log every mouse movement of every user every millisecond. You should not do that. forgot-to-think-about-it: in most cases, the main reason why people don’t collect particular data-points is simple. They forget that it should be collected. It happens, don’t worry. If you want to avoid it, I suggest setting up a workshop in which you sit together and talk through why, how and what data to collect. I write about these kind of workshops in a “story” article. And one more comment here. Some countries have strict legal restrictions about data collection, some others don’t. But regardless of the laws: always consider ethics. Never collect data from your users that you wouldn’t want collected about you. This is how data collection works. Google Analytics, Mixpanel, Crazyegg or your DIY data warehouses are all based on these principles. Of course there are small differences, which I’ll describe later, but for now you can be sure that you understand what happens in the background and you can be more confident acting on your data! One more: Always use multiple tracking tools. Google Analytics is a must. We have good experience with Hotjar and OpenInbound. Yes, absolutely agree – multiple tracking is important, also Google Analytics is a must. Haven’t heard about OpenInbound, but will take a look on that! Interesting post (as are most of your posts!). It would be interesting to hear a bit about the role of cookies in making this data more useful as well as a brief introduction into how to implement them. I’ll write an article about it! I’m learning really a lot from your Posts. Easy to read and good examples! Thanks for some useful insights here! I want to know more about the ‘Tracking Scripts’, how to code them & how to sort data at the backend. Since I’m not a tech guy, it would be really helpful for me. I found it very helpful for writing an essay about data collection for class.